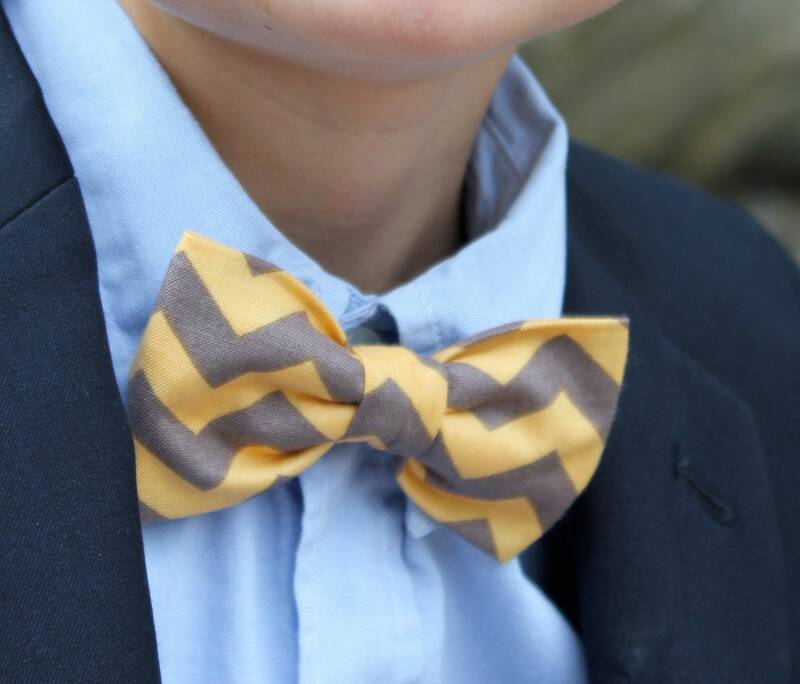 Stunning yellow and gray chevron makes a perfect tie!!! Perfect for a wedding! Stylish bow tie for a true gentleman. Available in different styles to fit any budget. Boys clip on bow ties are darling and easy to wear. A metal clip attaches to the collar and stays firmly in place all day. 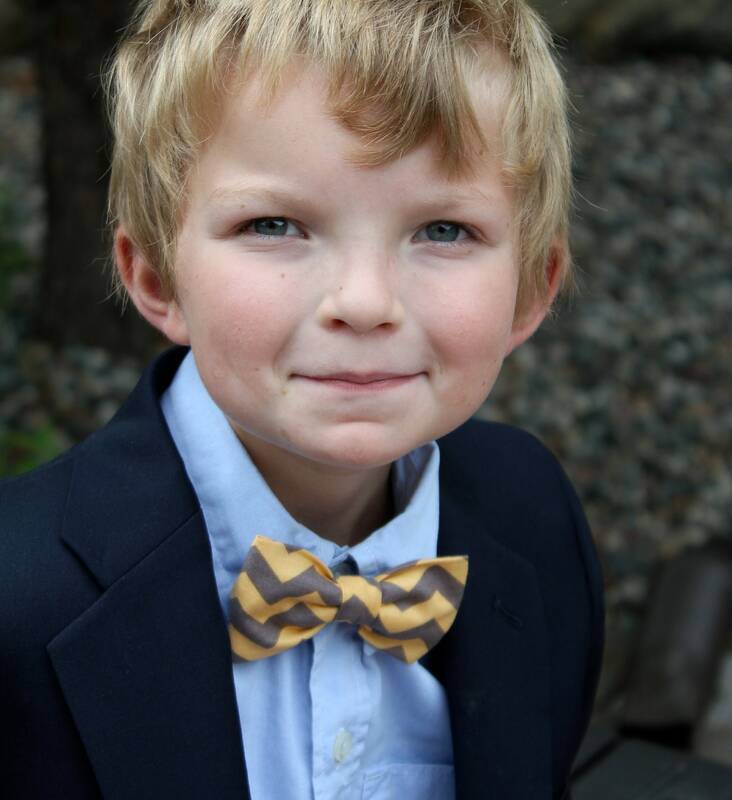 The men's clip on bow tie is a larger version of the boys clip on. It has a larger clip to accommodate a larger shirt, and a more substantial knot. The men's pre-tied adjustable strap bow tie looks just like the men's clip on, but instad of the metal clip, it has a 3/4 inch wide strap that goes around your neck and hooks securely and discretely under the bow. The self tying bow tie is for the true bow tie connoisseur. It has a European bow tie ribbon with a T hook that easily adjusts to your neck size from 13.5" to 18.5". If you require a larger size, just leave me a note at checkout, and I can make it any size you need. Custom orders of multiple ties and various sizes available (including mens sizes.) Just message me! I accept payment through paypal or by credit cards through Etsy. I also accept Etsy gift cards. I ship via USPS First class mail and First Class international mail. If you would like a different method, please contact me. I am happy to ship internationally, but cannot guarantee delivery. On all international shipping, please allow up to 1 month for the item to arrive. The buyer is responsible for any and all custom and duty fees as a result of the order. For International orders, please leave your name and address in the English form. If I cannot read the characters in the address, I cannot ship your order and may be canceled. Domestic orders can be tracked through your order on Etsy. International orders cannot be tracked, but you can see the date that they were shipped out. I am happy to accept returns or exchanges for all NEW, UNUSED non-custom orders. Please include your name and the order number with the return or exchange. Due to the nature of the items, all returns must be postmarked within 5 days of delivery. You will receive a full refund for the item, but not for shipping costs. I am unable to accept returns or exchanges on custom orders unless there is a defect in the product or manufacturing. If you have a question or concern, please contact me and I will see what I can do to help you. I'm happy to make custom orders. I can help you find the perfect fabric or I can use fabric you choose. Let me know how I can help you.